Harvard Education PR, 9781612501321, 248pp. How can an understanding of adolescent development inform strategies and practices for supporting first-generation college goers? 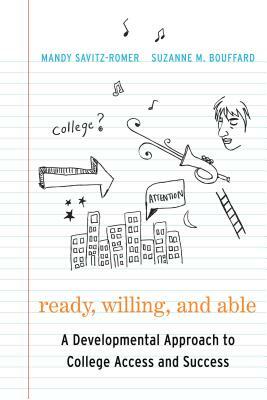 In Ready, Willing, and Able, Mandy Savitz-Romer and Suzanne Bouffard focus on the developmental tasks and competencies that young people need to develop in order to plan for and succeed in higher education. These include identity development, articulating aspirations and expectations, forming and maintaining strong peer and adult relationships, motivation and goal-setting, and self-regulatory skills, such as planning. The authors challenge the predominant approach of giving young people information and leaving it to them to figure out how to apply it. They show how well-intended college-access efforts can miss the mark--for instance, by focusing on students who already see themselves as college material, rather than working to help all students develop a "college-going identity." In addition, most college-access programs and practices focus almost exclusively on providing academic preparation and financial support. In Ready, Willing, and Able, Savitz-Romer and Bouffard call for a new approach: one that emphasizes the key developmental tasks and processes of adolescence and integrates them into existing college-access practices in meaningful ways. Rather than treating young people as passive recipients of services, they argue, adults can engage them as active agents in the construction of their own futures. Mandy Savitz-Romer is a faculty member and director of the Prevention Science and Practice Program at the Harvard Graduate School of Education. Suzanne Bouffard is a researcher and writer at the Harvard Graduate School of Education.